A few weeks back, we ventured out to Habitat for Humanity for the very first time. It's kind of lame that I haven't been there sooner, as the store is located literally only a couple of blocks away. And, being that we love to upcycle and do home decor projects, the store really is an ideal location for us to search for supplies. It's interesting to note that I've been connected to Habitat for years, without ever really realizing it. For example, whenever something goes clearance for a lengthy period of time at Home Depot, or if it's missing parts, rather than throwing product out, I usually end up writing it off, and sending it to Habitat for reuse. And walking into the store gave me almost an eerie feeling, as I walked past stacks of merchandise that had my hand writing on it, that I had deliberately sent there. It was cool and creepy at the same time... Almost like I had entered the Home Decor Twilight Zone. I was pretty impressed with the store, and the variety of hardware accessories, especially pulls and knobs. I also felt inspired by the various lengths of printed MDF that would make for great shelves, at a low cost. While we were admiring some light fixtures, Hazel became obsessed with a fireplace mantel insert, and refused to leave it alone. She immediately treated this insert like a little fort, and would cower into the corner whenever I tried to get her out. She ended up pretty dirty, but it was cute nevertheless. 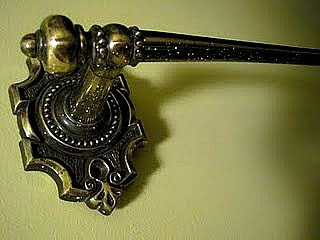 Of the finds of the day, we ended up only purchasing a single item: a lone towel rack with embellishments. It was beautiful, and we both saw great potential for it. We recently purchased a rail for our kitchen (from IKEA, of course- the BYGEL rail), after much admiration of many modern kitchens that use rails to hold pots, pans, and cooking utensils. 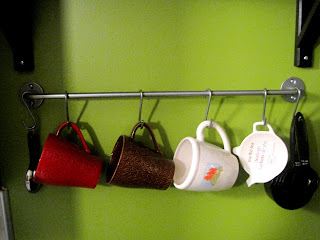 Ours holds mugs, a tea bag holder, and some measuring cups and spoons. All in all, I've been pretty happy with that purchase. And, I think that it was the first thing that I've wall mounted that didn't give me any grief! While we were quite smitten with the embellishments of the new rail, we didn't really have a purpose for, nor a desired location for it (generally, not the best way to do shopping). With the upheaval of our closet, we ended up placing our EXPEDIT bookcase full of art supplies across from our bed. The rationale behind the move was to place our supplies in plain sight, and in turn, would hopefully be inspired to do more projects if we were staring right at the supplies. 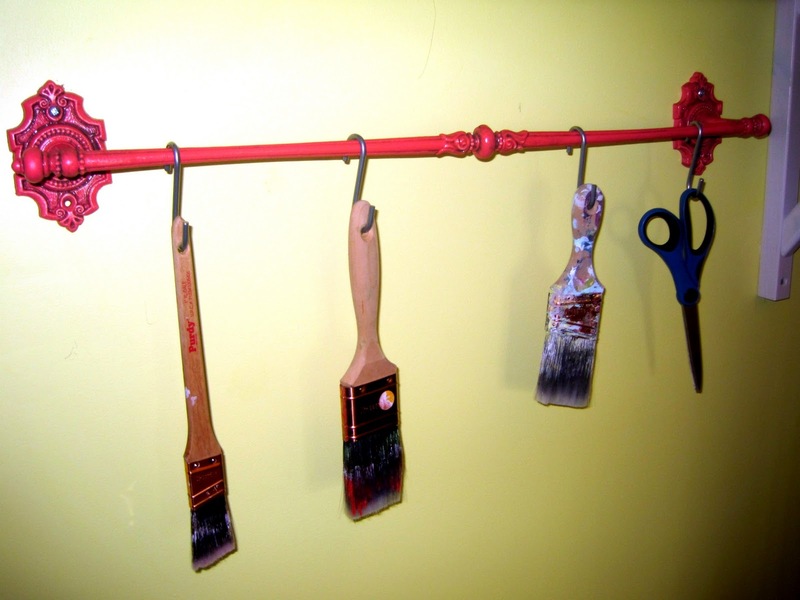 I had the idea of using some S-hooks to hang often used items on the rail, mainly paint brushes, and scissors, so they'd be within quick reach. And we had a bare wall adjacent to the one with the bookcase that has been bare since we moved in. Now, for the most difficult portion of the entire project: color. The rail was sort of an antique brass color, and we all know how much I LOVE brass... (that was sarcasm), and the rail had to be painted. We tossed the ideas around of painting the rail bright green, blue, or even oil-rubbed bronze (holla!). And the color we picked was *drum roll*: Terra Rosa! 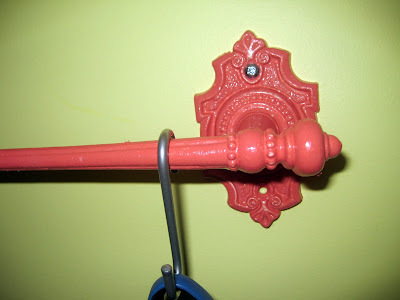 The very same color that I used for one of the hooks I made for the closet. Now, why would I want to match a color up in the closet, if it's not going to be in the same part of the room? Well, after we got that beastly shelf up, we realized that there was a bit of bare wall directly below the shelves that would be perfect for the rail. So, I primed it up, and put on 2 coats of Terra Rosa, and 2 coats of gloss varathane. 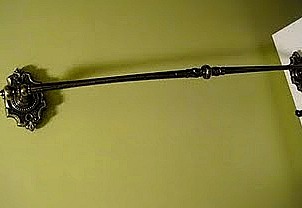 The rail was a snap to install, and I must say, my handyman-wall-mounting skills are improving! With the rail in the closet, it'll be kept close to some of our art supplies and canvases, and will keep commonly used tools close at hand, and will save me time from rummaging through the tool box for them. Something just felt a little off about the rail. 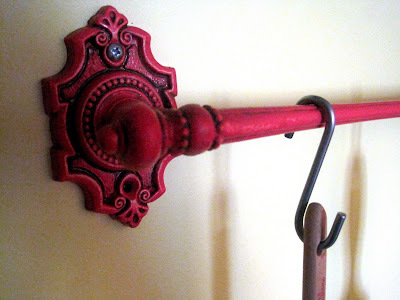 Jackie noted the rail's color was a bit too "salmon-y", and that the reason why the distressed hooks stood out so well, was because it was paired with that great brown. The wheels in my head got turning as I tried to figure out how to incorporate a touch of brown, and had the great idea of glazing the brown over top, so it would catch and puddle in the embellishments, to give it an aged feel. The problem: I have no glaze. The solution: I made some up! By using the same gloss varathane, I mixed in a dish a big blob of clear coat, with 1/4 of the amount of paint. I mixed it up, painted the rail, and wiped it off. The "glaze" caught brilliantly into the crevices, and it added some instant character and looks much less flat. 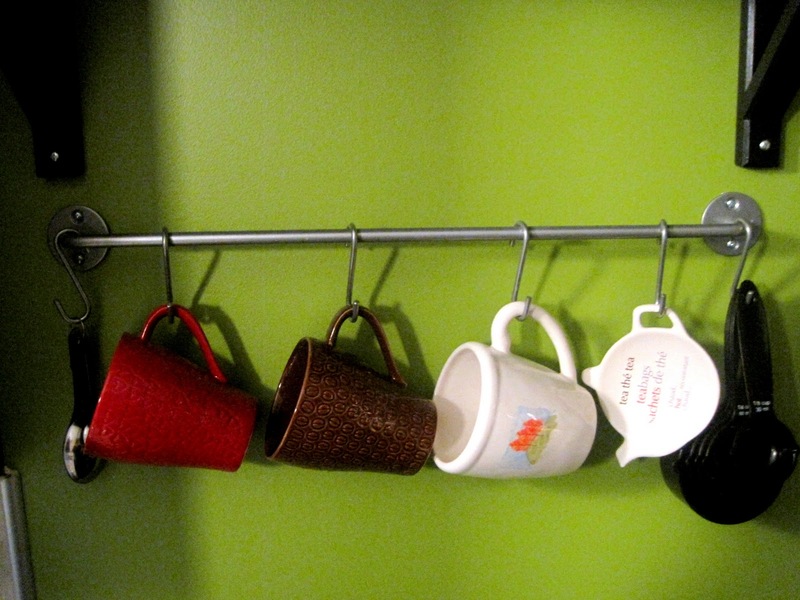 The only thing that I'm a little on the fence about is the s-hooks. I think they look a little off being unpainted.... I realize that not everything has to be matchy-matchy, but I'm unsure of the look. What do you think?- painted or unpainted?